The Sustainable Cities Network creates case studies in collaboration with our network participants in order to highlight innovative sustainability programs, so that other communities and organizations may replicate or emulate similar programs. 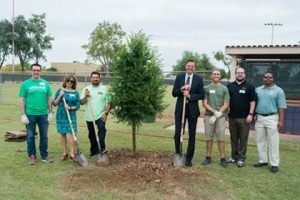 In 2017, the University Sustainability Practices (USP) office at Arizona State University (ASU) piloted a new urban forestry program to explore the viability of generating carbon offsets through local tree planting projects. The Urban Forestry protocol brings together municipalities and academic institutions in order to capitalize on these overlapping and shared priorities; the entities work together to plant the trees and participate in a peer review process to decrease the prohibitively high verification & validation costs.